For the past 27 years, Working Theater has been dedicated to producing plays for and about the working men and women of New York. I fondly remember their Tabletop, from 2000, written by Rob Ackerman, about the hilarious ego conflicts that go on behind the scenes in making a 30-second commercial. Ackerman is back with a new comic play, Call Me Waldo, directed by Margarett Perry, about an electrician who somehow begins channeling Ralph Waldo Emerson. Ackerman, a union man himself, a prop master for SNL for many years, also wrote Origin of the Species, later made into a film starring Amanda Peet. I spoke with the affable Ackerman. Hi Rob. Tell me about your new play. Call Me Waldo is a bit of a romance and a bit of a mystery. I had a strong compulsion to write about Ralph Waldo Emerson, but I did not want to write a didactic period piece. The seed of the play came when I pictured two working guys, two electricians. One of them, Lee, is literally possessed by the spirit of Ralph Waldo Emerson. And this little skinny guy scares the hell out of Gus, a big bear of a man, with his outburst. He incarnates him in a surprising way and frightens him. Some of the facts in Emerson's life are pretty startling. And a startling event (which you will have to see in the play) is what knocks Gus on his heels. So Gus seeks help from Lee's wife, Sarah, who is a nurse. And Sarah seeks help from Cynthia, a doctor, who is an attending physician in the E.R., to get a diagnosis on Lee. 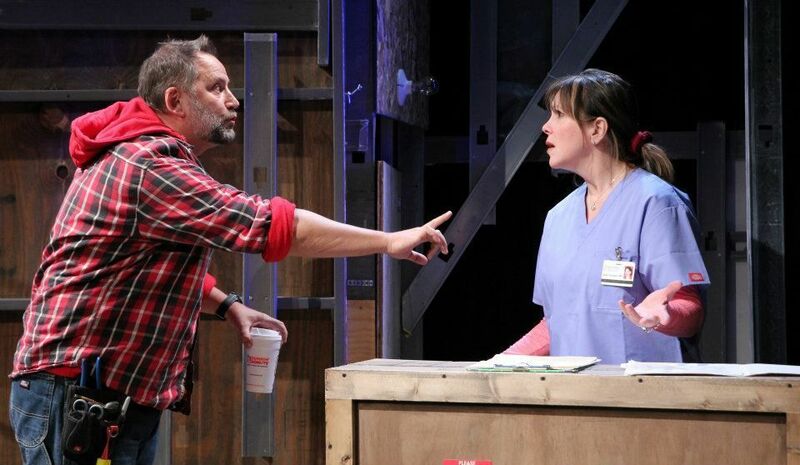 The play takes place in two worlds: the blue-collar world and the white coat world of nurses and doctors. So those are the four characters. Tell me what you can about what happens next. There is an element of magic in the play, and in the world. Emerson was a mystic, and he believed that magic is simply science that we don't yet understand. He embraced the magic in the world. He believed that nature is God and we are part of nature. Basically the play is a comedy of surprises for its characters. The characters are constantly being surprised. Emerson says you can fear the surprises or embrace them, and eventually the four characters learn to embrace them and each other. Tell me a little about the setting. This all takes place on Bethpage, Long Island; at work, at the hospital. It's a lot of locations. The staging is fluid and makes fast transitions. There are 20 different locations, a synagogue, a bedroom, the job site; lots of different places in Long Island. The whole set is a construction site. It's very tactile, with plywood, scaffolding, tools. And those things become other things as they switch locations from an office to a barbecue. The play works on different levels. There's a bit of a bromance, the two guys discover each other. It's a bit of a love story on a couple of levels. But it's also about a very odd sort of mid-life crisis. The reason I know these characters is because I am a union worker. I work with characters like these in my union jobs, where there are these tribal rivalries, like electricians versus carpenters. In the hospital world, there's a pecking order between doctors and nurses. One of the things that threads through the play is how we "otherize," and justify, and make hasty judgments about each other, and are almost always wrong in our judgments. I hope that's clear in the play. Emerson believed that every single person on earth has some capacity for genius, something that he or she knows that is special. In the play, Lee's discovery is that there is more to him than he knows. There is a crisis at the heart of Lee's life that is real. I hope that people will feel for, and with, the characters. You laugh, and then it turns on a dime. I hope people will walk out of the play invigorated. Emerson says to "check in with yourself," and find out if you're doing what you want to do. June Havoc Theatre, 312 W. 36th St., (212) 868-4444. Previews Feb. 14, opens Feb. 22-Mar. 11. $25. Sat. matinees Feb. 18 & 25 are pay what you can. Get tickets here.